Though it will be Saturday afternoon, there’s a good chance that we will begin the 35th Atlanta Jazz Festival “in church”, thanks to the first two artists. Opening the Festival at 3 p.m. will be reedman Dwight Andrews, who in addition to his prowess on the saxophone and flute, is also known as Rev. Dr. Dwight Andrews – Senior Minister of Atlanta’s First Congregational Church. We can expect the good Reverend Doctor, a Yale Music and Divinity grad, who is also an Emory University Music School Professor, to bring us some fine jazz with an ecumenical touch, such as in the clip below. Dr. Andrews will be followed by the Cyrus Chestnut Trio. Mr. Chestnut has held a prominent position in the jazz piano world ever since he captured public imagination with his Atlantic Records debut Revelation, back in 1994. Though Chestnut does not carry Dr. Andrews’ pastoral credentials, Chestnut’s playing has always had a very strong gospel influence, because of his deep church roots. He has even included a non-secular track or two on most of his albums. In 2009, he went all the way, releasing the beautiful Spirit, a solo piano album of gospel tunes. Last year, he returned to the trio format with Journeys. His latest release is his first pure quartet date. It’s called, appropriately, The Cyrus Chestnut Quartet; it features the terrific young saxophonist, Stacy Dillard. Mr. Chestnut and his trio are scheduled to hit the AJF mainstage at 5 p.m. I’ve seen him live a number of times and I’ve never been disappointed, he plays a bop/blues/gospel hybrid that is second to none. If you’re planning on catching the Atlanta Jazz Festival on Saturday, May 26, make sure to get there in time for Cyrus Chestnut. He’ll leave you with a smile on your face and joy in your heart. 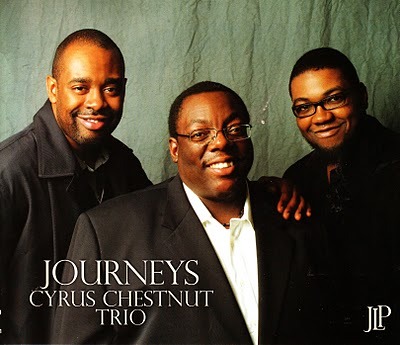 This entry was posted on May 6, 2012 at 12:21 am and is filed under Atlanta Jazz Festival 2012, JazzLives!, The Jazz Continues... with tags atlanta jazz festival, cyrus chestnut, dwight andrews. You can follow any responses to this entry through the RSS 2.0 feed. You can leave a response, or trackback from your own site.